Home » Blog » Guillaume Lecanteur » Guillaume Lecanteur — A Man with Itchy Feet? 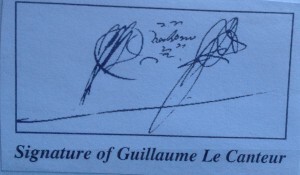 Guillaume Lecanteur — A Man with Itchy Feet? My initial introduction to Jeanne’s first husband Guillaume Lecanteur was brief. It was a short reference to his birth and parents, his marriage to Jeanne, their children, and then to his disappearance in the Quebec region around 1678, leaving Jeanne with three children. Details were few. Cited as being in Quebec in July 1670, he signed a marriage contract with Jeanne on October 11, 1671 and then married her in a religious ceremony eight days later. The marriage contract placed his baptism in 1646, in Saint-Jacques de Sauveur Church, in Beaumont-en-Auge, France, a small hilltop village not far from Deauville and Honfleur, in the middle of Normandy. Since that first introduction to Guillaume, ferreting out his story has become a secondary obsession of mine. In addition to a paucity of information about him, that which does exist can often be confusing. Perhaps because he left no descendants in Canada, little attention has been paid to the details of his life or his family. Here is what I have learned from notarial records, Internet searches, correspondence, conversations, and some speculation – so far. According to the Fichier Origine, a database developed and maintained by the Quebec Federation of Genealogical Societies, Guillaume apparently had two sisters, an older sister Marie and one named Guillemette who may also have been born the same year as Guillaume, making them possible twins. Guillemette married in 1666, four years after their father died. That’s all that’s known about his family in France. And my visit in the fall of 2013 to Beaumont-en-Auge uncovered nothing more. In the records I have found so far, Lecanteur is frequently referred to as “Sieur de La Tour” and “dit laTour.” According to Historian Leslie Choquette, those titles, both roughly translated as “Mister from la Tour,” can imply some level of respect, even a higher rank in society, perhaps a member of the “Petit Bourgeoisie.” His signature would bolster that conjecture, since he signed his name with quite a flamboyant flourish, hinting of education. It is definitely not one of a typical peasant or engaged laborer. From what I have discovered so far, this analysis seems to ring true. The notarial records confirm that the man who was to become Jeanne’s first husband was indeed already in Quebec in 1670, at least a year before Jeanne arrived in late summer 1671. Because he was not listed in either the 1666 or 1667 census, it is most likely that he arrived after that date – although the census count was not always 100% accurate, I’ve learned. Information about how or when he arrived in Quebec is missing. So far I’ve not found any ship records documenting his voyage or any association he might have had with others in Quebec. Therefore, I’ve found nothing more about him in Quebec before July 9, 1670 when he received that concession of land on the St. Charles River, slightly northwest of the center of Quebec City. The marriage contract with Jeanne lists Guillaume as a “habitant,” or farmer, and as being from Boyer Point, La Durantaye. There are no records that Lecanteur had land there. Given that at the time of their marriage he had actually leased land elsewhere, it is a mystery why the marriage contract contained this reference. I’ve put the exploration of possible answers on the “to be investigated” list for my next trips to France and Quebec! His “entrepreneurial” land dealings added to the mystery that surrounds Lecanteur. On July 9, 1670, Guillaume received that grant for land along the Charles River from Toussaint Toupin, a prominent businessman in Quebec City and Trois Rivieres. Assuming the records and my research are correct, the grant would have been at the base of Avenue Saint Sacrement, not far from where I stayed in Quebec City. It is now a peaceful cemetery, set beside the river. Visiting that site in the summer of 2014, I could almost picture Lecanteur standing with his hands on his hips, looking over the land, and wondering what he was going to do with it. As a grant, it still needed to be cleared and thus required a lot of hard work to turn it into a farm! On October 20th of 1670, he signed an agreement to conduct some sort of work on land on the outskirts of Quebec City. I am still trying to figure out what he agreed to do or what happened to that agreement. Six days later, he signed a lease with Toupin for land further east of Quebec City on the north shore of the St. Lawrence River. He apparently changed his mind and annulled the lease after less than a month. In September of the following year, Lecanteur sold the land he’d been granted along the Charles River. By the time he executed that sale, he must have already met Jeanne since they were married a month later. When Lecanteur met Jeanne, it is not clear where he was actually living. A day before they were married on October 19, 1671, he signed a two-year lease for what appears to have been a farm in Charlesbourg, a town just 16 kilometers northwest of Quebec City. After their marriage, Lecanteur continued to make deals for land, and there are more records of transactions first in L’Ange Gardien on the north shore of the St. Lawrence where they eventually settled, for land on the south shore of the St. Lawrence, a little over 50 km east of Quebec City, and finally for land in Ile d’Orleans in the middle of the St. Lawrence. In 1676, he was sued for failing to comply with the terms of one of those transactions! In the archives in Montreal, I found a book about the Levesque family that includes a brief reference to Guillaume Lecanteur. He is described by the author as possessing “la bourgeotte.” Apparently this is a French term for having “itchy feet,” or “having ants in his pants,” “being always on the move,” or “unable to commit.” It seems to fit with what I know about his life so far and his signature analysis. The question really is though, was this unusual behavior for a man of that time? Was Lecanteur “poor and unstable,” as another author labels him, or was he just one of a group of entrepreneurial men, typical of early Canada?